DEBORAH POTTER, correspondent: On the Lower East Side of Manhattan, just a few blocks from the Bowery, the line forms early outside St. Joseph House. Four times a week, volunteers make gallons of soup from scratch and each day feed more than a hundred men. MICHAEL GREENBERG (Catholic Worker Volunteer): People here personally emulate Christ. I'm not Christian, but I could really respect that. POTTER: Donations keep the soup line going. St. Joseph's takes no government money. Volunteers pray quietly before opening the door to those they call their guests, and they protect their privacy: No pictures allowed once the meal begins. St. Joseph's is a house of hospitality run by the Catholic Worker movement, started in 1933 by Dorothy Day. Born in 1897 to a middle-class family, Day dropped out of college to become a journalist and activist in New York. She wrote for socialist newspapers like The Call and demonstrated against the First World War. She also fell in love. 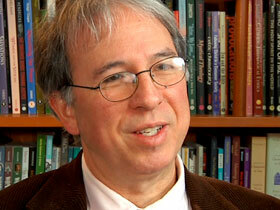 ROBERT ELLSBERG (Publisher, Orbis Books): She was very young. She found she was pregnant. He said he would leave her if she didn’t have an abortion, so she did and then he left her anyway. 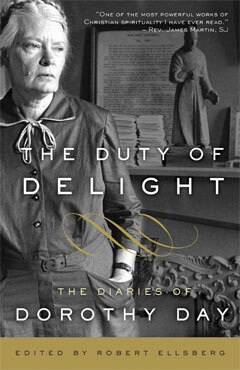 POTTER: Robert Ellsberg got to know Day near the end of her life and edited her letters and diaries. ELLSBERG: People have an idea that she was somehow sort of scary, because she looks so serious in so many pictures. The funny thing is that anybody who knew her, the primary thing you remember about her, her characteristic, was her laughter and how funny she was. POTTER: In her late 20s, Day lived with a fellow radical whom she adored but who opposed both marriage and religion. Then she learned she was pregnant again, and that changed everything. Dorothy Day converted to Catholicism at the age of 30 and was baptized in this church near her home in Staten Island. She turned to God, she said, in gratitude and joy over the birth of her only child. She broke off with the baby's father and raised her daughter alone, still working as a journalist but searching for a way to connect her social values to her deepening faith. The answer was to start the Catholic Worker, a newspaper priced at a penny that's still published today, and that provided funds for a growing movement to help the poor. 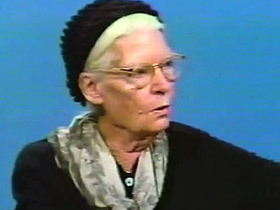 Dorothy Day interview in 1971: If your brother is hungry, you feed him. You don’t meet him at the door and say, “Go be thou filled,” or “Wait for a few weeks, and you’ll get a welfare check.” You sit him down and feed him. And so that’s how the soup kitchen started. POTTER: Jane Sammon joined the Catholic Worker movement near the end of Day's life. JANE SAMMON (Maryhouse): Here was a group of people who really, really were talking issues about the poor, but they were also living among people who were poor. They weren’t just speaking about it from a distance. They were willing to risk suffering for their belief, going to jail perhaps. POTTER: Day herself was arrested and jailed multiple times. This iconic photo of her last arrest at the age of 75 while supporting striking farmworkers hangs in the Catholic Worker newspaper office in New York. She led anti-war demonstrations for decades and refused to pay taxes. 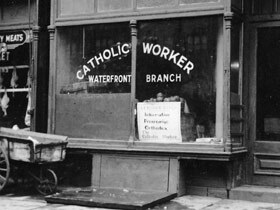 For Day, the Catholic Worker wasn't just about good works. It was meant to be revolutionary. Dorothy Day interview in 1974: The Catholic Worker is essentially a school, you might say. I mean, it’s a place where you…where you…a lot of young people come to us…It’s a pacifist, anarchist movement, and they come to us to learn more about this point of view of beginning a change from the bottom up, rather than from the top down—through unions and credit unions. You do away with banks by credit unions…you do away with interest, you do away with…by mutual aid. You do away with possession of goods by sharing. POTTER: Dorothy Day spent her final years at this Catholic Worker house in Manhattan, where she died in 1980. Now, she's on the road to sainthood, with the unanimous support of the U.S. Conference of Catholic Bishops. Moderator at US Conference of Catholic Bishops meeting in November 2012: All those in favor of supporting moving forward, please indicate by saying aye. Cardinal Timothy Dolan (USCCB President): Thank you, good to hear. POTTER: New York Archbishop Timothy Dolan is leading the cause, calling Day a saint for our times. 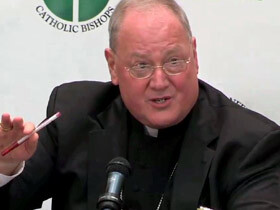 CARDINAL TIMOTHY DOLAN (at press conference): So there was sexual immorality, there was a religious search, and there was a pregnancy out of wedlock and an abortion. Her life, of course, like Saul on the way to Damascus, was radically changed when she became introduced to Jesus Christ and his church, and after that she became an apostle. POTTER: Day already has her own stained glass window in the church where she was baptized. Her image has been made into icons. But some in the Catholic Worker movement are leery of the push for sainthood. SAMMON: The fact that Dorothy Day had an abortion, to say, well, now she’s going to be labeled the right-to-life saint—to me these diminish this beautiful spirit that was larger than any one particular part. 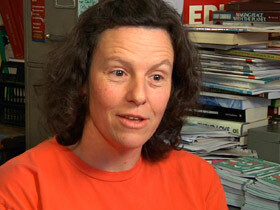 JOANNE KENNEDY (Managing Editor, The Catholic Worker): I don’t want her to be the saint who had an abortion. I want her to be the mother of one and the grandmother. You know, that's who she was. POTTER: Joanne Kennedy is managing editor of the Catholic Worker. KENNEDY: You can’t know Dorothy Day and not know about her pacifism and her commitment to the works of mercy, although that gets a little more play. But her pacifism gets almost none. CARMEN TROTTA (Catholic Worker Volunteer): The thing that primarily drew me to the Catholic Worker initially was that there was a Catholic entity that was seriously, but seriously anti-war. It doesn't appear that some of the bishops who want her to be a saint—it doesn't appear that they care for her. POTTER: Day didn't care all that much for the Catholic hierarchy, either. She was a faithful, traditional Catholic whose life was steeped in prayer, but her longtime friends say she was also an independent woman. PATRICK JORDAN (Former Editor, The Catholic Worker): She said there were so many popes and abbots and bishops who, they were—those were not the models to follow. The models were the saints, and it was the saints who constantly replenished the church—the saints and the sacraments. ELLSBERG: What particularly she didn’t like about it was this idea, I think, of being, you know, treated as some exceptional person who would let other people off the hook. 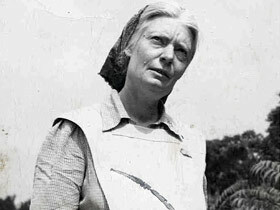 POTTER: Those who knew her best say Dorothy Day wouldn't care one way or another about being canonized. JORDAN: The important thing wouldn’t be that. The important thing would be how well are we doing the work that we’re supposed to be doing, you know? How well are we living a gospel life? ELLSBERG: There are certain kinds of people, like a Dorothy Day, who kind of stop us in our tracks because they represent something new. They represent a way of being faithful in response to the particular challenges of our time, and they kind of invent a new way of being faithful to Christ, and I think Dorothy Day certainly did that. POTTER: She also left a legacy. There are now more than 200 Catholic Worker houses all over the world, more than when she was alive, each one independent, serving the poor, and passionate about peace. KENNEDY: I just truly believe that she remains with us and through her grace and the Holy Spirit, grace of the whole communion of saints that looks out for us, which is absolutely the only way that we continue to survive, we’re just led. POTTER: The path to formal sainthood can take decades. For many who believe in what Dorothy Day stood for, she's already there. JORDAN: I have no doubt that she’s a saint. None whatsoever. 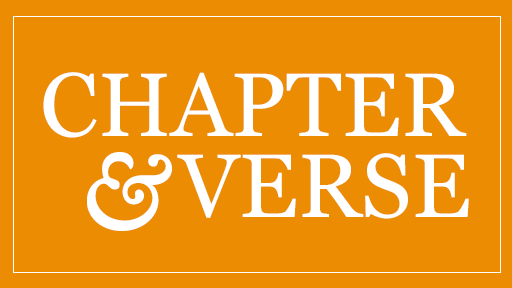 POTTER: For Religion & Ethics NewsWeekly, I'm Deborah Potter in Staten Island, New York. July 19, 1943 What I want to do is get a job, in some hospital as war-maid, get a room, preferably next door to a church; and there in the solitude of the city , living and working with the poor; to learn to pray, to work, to suffer, to be silent. The world is too much with me in the Catholic Worker. The world is suffering and dying. I am not suffering and dying in the CW. I am writing and talking about it. … I have always been so sure I was right, that I was being led by God—that is, in the main outlines of my life—that I confidently expected Him to show His will by external events. And I looked for some unmistakable sign. I disregarded all the little signs. I begin now to see them and with such clearness that I have to beg not to be shown too much, for fear I cannot bear it. I need strength to do what I have to do—strength and joy and peace and vision. June 19, 1973 We feel so powerless. We do so little, giving out soup. But at least we are facing problems daily. Hunger, homelessness, greed, loneliness. Greatest concern of the bible is injustice, bloodshed. So we share what we have, we work for peace. October 22, 1976 Awoke in great misery. Board of Health threating to close us. Letter from Della yesterday and a gift. “Love is an exchange of gifts.” (Where did I hear that?) What a joy to say the Gloria in happy moments and the Credo when in need of reassurance and the Ave too with its conclusion, “Now and at the hour of our death.” The Eastern churches know the value of repetitious prayer. February 15, 1977 I remember the first radio I had in the early 20s, constructed for me by Willy green, a 12 year-old boy, out of a cigar box, a crystal and a bit of wire, an aerial and earphones. Manipulated properly, from my seashore bungalow in Staten Island, I could hear a presidential campaign, Saturday p.m. broadcasts, football, and miracle of miracles, symphonic music. That little radio was a miracle box. I could not understand it. If this is possible, anything is. Planting a garden, reaping a harvest…Having a baby, the greatest miracle of all. So I could take on faith the truths of Christianity, the Church, the sacraments. My heart swelled with gratitude. Faith came to me just like that, and the need to adore. I could not understand the mechanism of that little box with its crystal, set like a jewel to be touched by a bit of wire. It was a miracle to hear voices of people in conversation, a symphony orchestra playing Beethoven. If I could not understand scientific truths, why should I worry about understanding spiritual truths of religion? I wanted to say yes, this is true. March 13, 1978 Across the street from my window on E. Third St. is a sycamore tree with a few little seed balls hanging from it. When I first get up and sit by the window, the rising snow at the foot of the street has made it a golden tree and during the heavy snows a tree white and gold, a joy to survey. I begin my a.m. prayers with thanksgiving. A radical who was arrested often for her protests against war and injustice, Dorothy Day converted to become a devout Catholic and a champion of the poor.